Standard & Poor's official word on dividend-rich investing--now completely updated with 1997 data. This invaluable resource distills Standard & Poor's successful dividend investment philosophy into a user-friendly guide for the individual investor. the authors, both editors of Standard & Poor's high-rated investment newsletter, The Outlook, tell readers why dividends are a vital part of the investment equation, what to look for in a dividend-paying stock, which stocks are the dividend leaders, and who successfully uses dividends as a stock picking tool. Your Future Paychecks And Raises: Get Dividend Checks In Your Mailbox Paid To The Order of You! Joseph Tigue is Managing Editor of Standard & Poor's investment advisory newsletter, The Outlook, as well as Editor of S&P's Directory of Dividend Reinvestment Plans. Mr. TigueÕs frequent appearances in the business media have included NBC, CNBC, CNN, PBS, the BBC, and various radio shows. He lives in Westbury, New York. Joseph Lisanti is Senior Editor of Standard & Poor's The Outlook. Prior to joining S&P in 1989, Mr. Lisanti was Senior Editor of PhysicianÕs Financial News and Managing Editor of Fact: The Money Management Magazine. He lives in New York City and Great Barrington, Massachusetts. My dividend stocks have all been tanking so the dividends don't much matter. It's one way to invest, but dividends are slow and momentum investing is fast. Now most investors and money managers buy stocks with the hope of short-term appreciation. Few buy them with the intentions of receiving dividends. However, when an investor purchases a company's stock, he or she becomes a partial owner in the business. As a benefit of being an owner, an investor receives a part of the company's earnings in dividends. 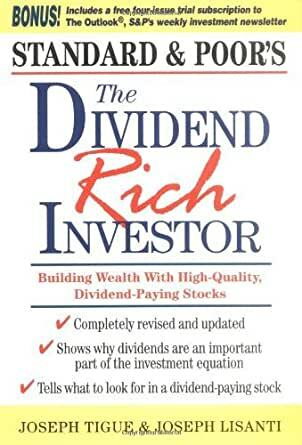 This book teaches readers about dividends, their importance, what to look for in a dividend-paying stock, how dividends pay for the stock, and much more. The last chapter lists selected stocks with good dividend records. 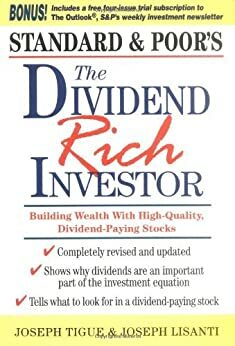 This book is an excellent introduction to dividend investing. As I said in the title, and many other reviewers have pointed out, this is an excelent book for beginners in the stock market. Even more if you're confused by the array of stocks to buy and techniques to select them. Having said that, I must point out one major flaw that I think the authors have made when writing the book. In the first chapters they mention the total return that an investor would have received from SP500 in the 70s based in the index itself and with the dividends reinvested. In my opinion, being the SP500 a total return index, i.e. one in which the reinvestment of dividends is included, the total return should be the same. Nonetheless the idea makes a point in showing the importance of dividend reinvestment policies. Besides this minor mistake, the book is an excelent read and guide to the stock market. A very good book on how to buy common stocks directly from the company. I have a friend who is a stock broker at a major firm and all the scams that go on there I am shocked that more stock brokers are not doing time. Even main stream firms stink of the boiler room. They push the stock of the day and most brokers know little to nothing about the market, they're just there to sale the stock the firm tells them to sale. Total boiler room hype! Drips are the best way to buy stock. Why pay stock broker fees. Buy direct. Save money. This book tells you how. 5.0 out of 5 starsDividends, the key to investing success.. This is a very good book, and simple to read for even novice investors. A note, the entire book deals only with US listed stocks, so, to buy any of the stocks listed here, you need a broker with access to US markets. The book covers compounding of dividends, a very, very important subject. It also warns about selecting stocks with yields that are too high, and unlikely to be maintained, or stocks which have a high yield, but are cyclical. This is a very good book, for anyone, who might be considering thier retirement investment strategy. A word of warning: This book is not about returns of 2000% per annum. Dividends are dull and boring. But, they make a good basis for investment.